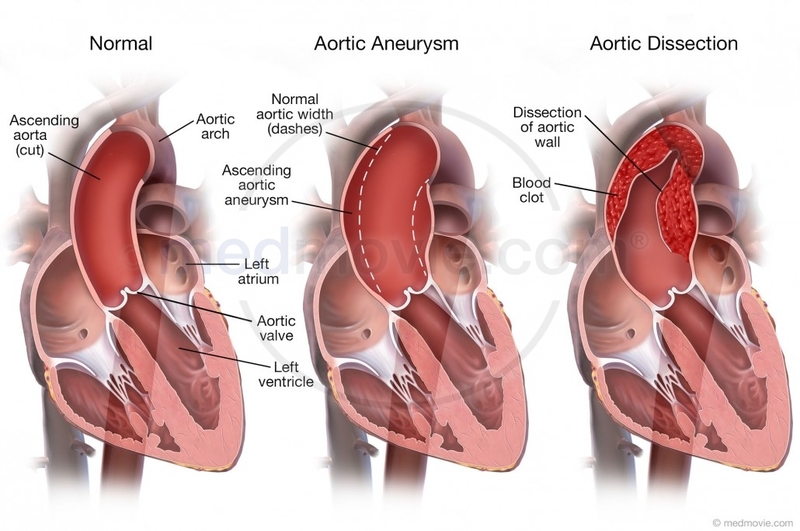 An aortic aneurysm is an enlargement or bulging of the aorta. The aorta is the large artery into which blood is pumped from the heart. It is normally about the size of a garden hose. It travels from the chest to the legs, giving off branches that supply all the organs of the body, finally dividing into the two large branches that supply the legs. Aneurysms usually develop in a section of the aorta, often starting as a small enlargement that grows with time. Aneurysms can occur in any part of the aorta. Aneurysms can cause symptoms such as pain, can contain blood clots and can leak and rupture, often suddenly. Most aneurysms, however, will not cause symptoms until they leak or rupture, a surgical emergency. Aneurysms in the chest are called thoracic aneurysms. Type A thoracic aneurysms involve the first (or ascending) part of the aorta. Type B thoracic aneurysms involve the part of the aorta that curves down toward the abdomen (the descending thoracic aorta) . Abdominal aortic aneurysms are in the aorta of the abdomen. The risk factors for developing an aneurysms are essentially the same as those for developing atherosclerosis of the arteries (fatty, cholesterol containing blockages) and include high blood pressure, high cholesterol, smoking and a family history of aneurysms, particularly involving the abdomen.